Pin It Sometimes it's hard to be so far away from your family. It's not like I can just hop on a plane and go to Brazil anytime I want to. But I phone a lot. Last time I was homesick I called my mom and she was reminding me about this restaurant on the countryside where we have this blackberry drink. It's made with blackberries, milk and sugar, pretty simple. But blackberries are not so common in Brazil, so this was always a treat for us. And my mom loves it. So I saw some blackberries at the market and decided I was going to make the same drink and pretend I am at the countryside looking at the beautiful landscape along the road with mommy. This is a nice drink, a healthy snack and the colour is just beautiful. 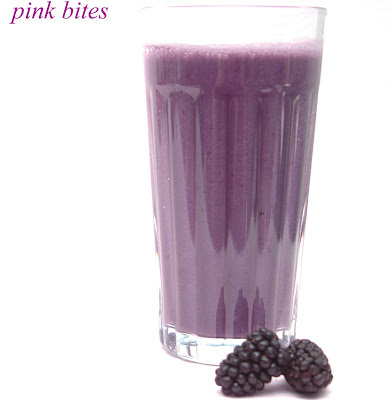 Blend blackberries and cold milk (or soy milk) until smooth. If you are very picky about the seeds, strain it. Sweeten to taste. This is more of a juice consistency than a smoothie, I don't add any yogurt or ice to it. ur a liar i made it !! !